Football hooligans and members of the German far right clashed with riot police in the centre of Cologne on Sunday as a demonstration against Islamic extremism turned violent. About 2,500 hardline football fans and members of neo-Nazi organisations gathered under the banner “Hooligans against Salafists”. The march had been registered by a regional far-right party, called “Pro NRW”. A counter demonstrations under the motto “Shoulder to shoulder against racism and religious extremism”, organised by anti-fascist activists, had drew about 500 people. Cologne newspaper Kölner Stadt-Anzeiger said drunken protesters hurled bottles, rocks, fireworks and bicycles at police, injuring at least 13. One police van was tipped over. Some of the protesters were reportedly shouting “Foreigners out” and “Free, social and national: National Socialism now”. Police in riot gear used to batons, pepper spray and water canons to contain the situation and made six arrests. 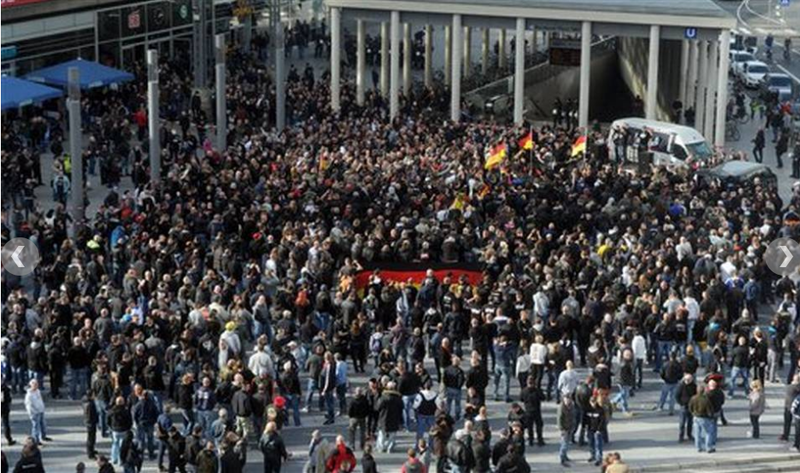 A police union spokesperson told Die Welt that they were dealing with a new phenomenon inside the German football hooligan scene which could become highly dangerous. Earlier this month, the northern German cities of Hamburg and Celle had seen violent clashes between Kurds and Salafists, fuelled by the ongoing conflicts in Syria and northern Iraq. At about 7pm, a police spokesperson said that they were managing to calm down the situation and that most of the protesters were leaving the city by train.